Heart attacks can occur with varying severity, and just as a fracture may be hairline or major, a heart attack can be mild or massive. The severity of a heart attack is determined by the extent of the damage caused to the heart itself—in the case of a mild heart attack, a relatively small portion of the muscle is damaged or the majority of damage sustained is not permanent. No matter the situation, if you feel that you are experiencing heart attack-like symptoms, it is important to seek emergency medical care as both mild and massive heart attacks are very serious and can leave you with lasting damage. What is the difference between a mild and massive heart attack? Heart attacks occur when there is a blockage in the artery that impedes the flow of blood into the heart. A massive heart attack may happen if blood flow is completely cut off by the blockage and can cause permanent heart damage, cardiac arrest, or death. Massive heart attacks may also occur if the blockage is impeding blood flow in a larger artery. In comparison, a mild heart attack either occurs when there is a blockage in one of the smaller arteries of the heart or the blockage does not completely stop the flow of blood to the heart muscle. Mild heart attacks may also cause damage to a smaller portion of the heart, less of which is permeant. Finally, mild heart attacks do not last as long as massive heart attacks. 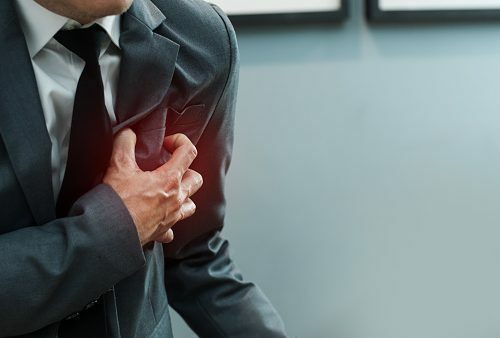 The symptoms of a mild heart attack are similar to those of unstable angina and include chest pain that may radiate to the arms and jaw, difficulty breathing, nausea, light-headedness, cold sweats, and feeling as though your heart is racing. These symptoms may last for a few minutes. What happens after a mild heart attack? After experiencing a mild heart attack, other symptoms may make themselves known and affect your physical and mental state. You might feel fatigued, as the episode will have weakened your heart muscle and made it more difficult for the heart to pump blood throughout the rest of the body. You may also experience some discomfort in your chest, as damage to the heart impairs blood flow and can result in chest pain. Depression is another side effect of experiencing a mild heart attack, as after such a traumatic event, you may feel a fear of death or mortality as well as a loss of control over your life. Finally, heart arrhythmias may develop after a mild heart attack, as part of the muscle that conducts the impulse to beat may be damaged and cause the heart to beat irregularly. To distinguish a mild heart attack from stable angina, your doctor may order an electrocardiogram so that they can analyze the pattern and discern whether the heart attack was typical or mild. A blood test may also be able to confirm whether the patient has suffered a mild heart attack, as can an echocardiogram, ultrasound of the heart, angiogram, or x-ray of the coronary arteries. To treat a mild heart attack, doctors may prescribe medications such as nitroglycerin, which widens the blood vessels. Anti-ischemic drugs may also be prescribed as they can prevent chest pain, while anti-inflammatories and blood thinners may be given in order to prevent the formation of clots. Stop smoking: Smoking is a major risk factor for heart disease, as it damages the walls of the blood vessels and may prevent blood and oxygen from reaching the heart and organs. Smoking tobacco also encourages the formation of blood clots that can cause heart attacks, while the nicotine found in cigarettes can raise your blood pressure. Control your blood pressure: Managing your blood pressure can prevent excess stress from being placed on your heart and blood vessels. Talk to your doctor about ways to naturally lower and manage your blood pressure, as well as the medicinal options that are available to you. Control your cholesterol: An excess of LDL or “bad” cholesterol can increase your risk of heart disease, and if your levels are high, your doctor may recommend a prescription to control it as well as encourage you to eat healthier and exercise regularly. Check for diabetes: Be sure to get screened for diabetes, as both type 1 and type 2 diabetes can increase your risk of suffering a heart attack or stroke. Exercise: Exercising regularly—especially cardio activities—can help make your heart stronger and lower your cholesterol and blood pressure. Jogging, running, walking, bicycling, and swimming are all good examples of cardio exercises to help get your heart pumping. Eat a healthy diet: Certain foods contain saturated fats that can cause plaque to build up in your arteries and impede blood flow, eventually causing a heart attack or heart failure. Avoid these foods and increase your consumption of foods that are low in cholesterol and saturated fats like fruits, vegetables, white meat, and fish. Mild heart attacks may not be as severe as massive heart attacks, but they can still cause lasting damage that may cause complications further down the road. If you feel you are experiencing a heart attack, it is important to seek immediate medical attention.